Modern, living microbial mats in Bridger Bay, Antelope Island, Great Salt Lake, in October 2013 when the lake was nearly 5.5 feet below its historical average of 4200 feet. 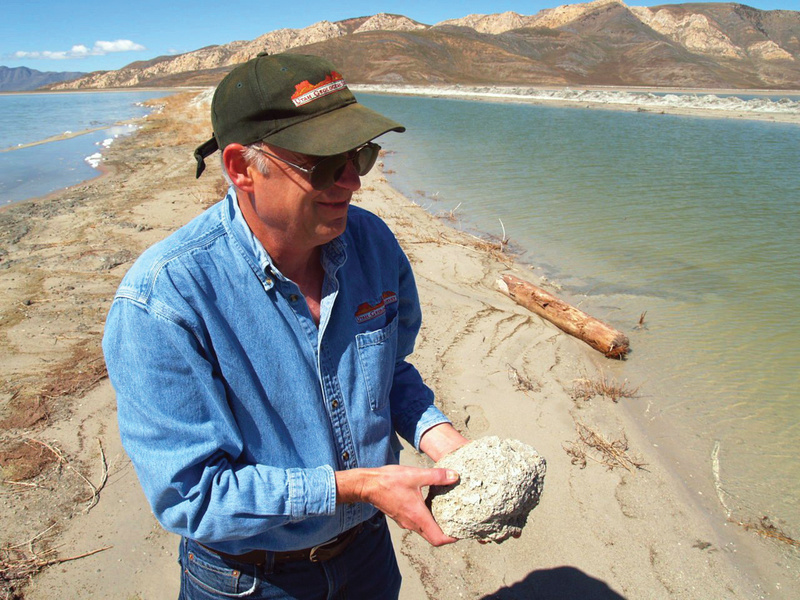 UGS geologist Tom Chidsey holds a small, bleached-out (no living organisms) stromatolite near Stansbury Island, Great Salt Lake. Photo by Michael Vanden Berg, UGS. Tom Chidsey has been a geologist with the UGS since 1989, and serves as the Petroleum Section Chief in the Energy and Minerals Program. Besides microbial carbonates, other recent projects include evaluation of potential Paleozoic shale-gas reservoirs, a compilation of Utah’s major oil plays, analysis of the Mississippian Chainman Shale of western Utah, and determination of best management tools for produced water in the Uinta Basin. He also conducts numerous industry and university workshops using the UGS core collection and leads field trips to areas studied as parts of various projects. Michael Vanden Berg, UGS geologist. 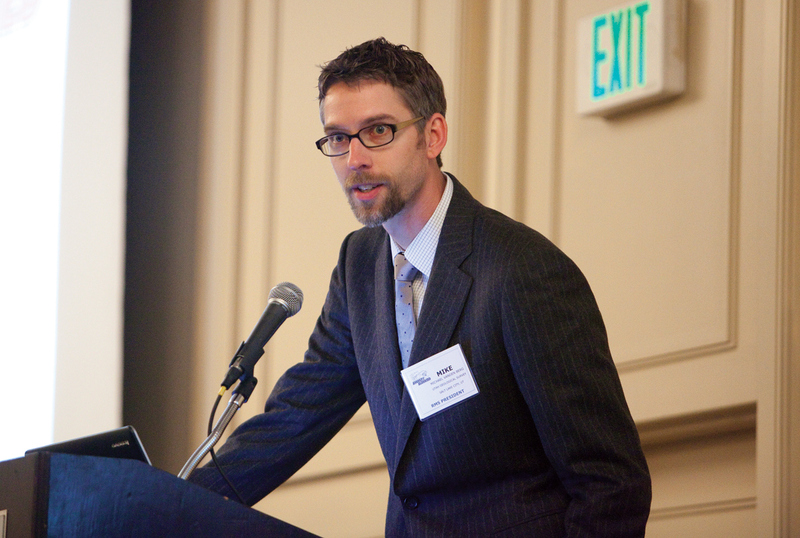 Michael Vanden Berg has been a geologist with the UGS Energy and Minerals Program since 2003. 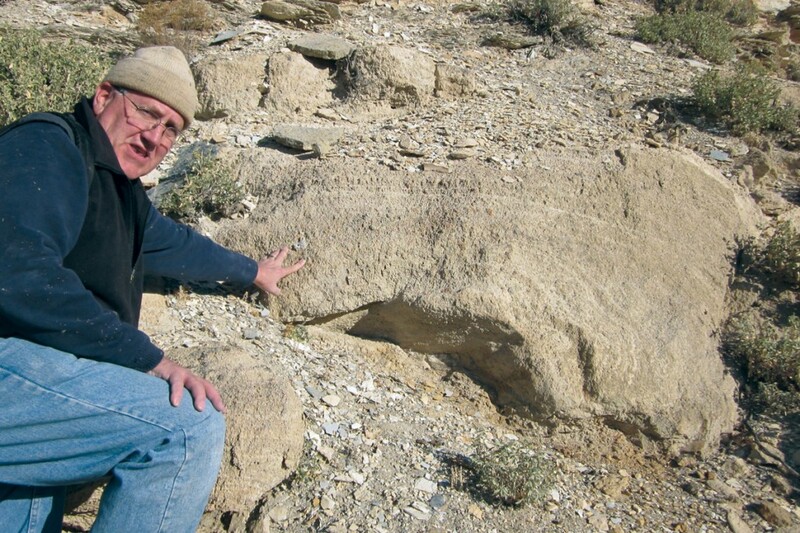 Michael’s research focuses primarily on the petroleum-bearing units of the Uinta Basin, in particular the Green River Formation. Current research includes a detailed analysis of the unconventional Uteland Butte reservoir, characterization of the immature shales from the upper Green River, and examination of the microbial carbonate units with comparisons to modern microbialites found in Great Salt Lake. Mike Laine was the UGS’s UCRC curator/geologist from 2004 to 2012 before leaving to join his family in California. As curator, Mike managed general UCRC operations, oversaw two major UCRC expansions, obtained many additional cores from wells drilled in Utah, hosted numerous industry and university core workshops annually, and assisted with geologic research using the core collection. When British rock and roll bands, such as the Beatles and Rolling Stones, first came to America in the 1960s, it was referred to as the “British Invasion.” Last year it was our turn in a different type of “rock” invasion, on mini-scale, as we “invaded” London to represent Utah at a special symposium on microbial carbonates, sponsored by The Geological Society (of London). Microbial carbonates are a distinctive type of oil reservoir rock that until recently was unrecognized in terms of oil potential and economic importance on the global scale. New billion-barrel, microbial-carbonate oil fields have been discovered offshore of Brazil, in the Caspian Sea region of Kazakhstan, and in other areas of the world. 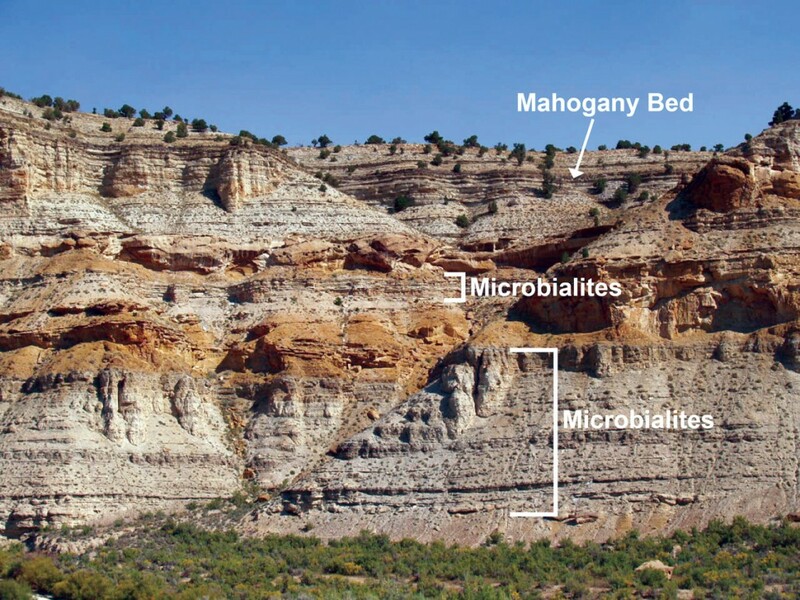 Research by the Utah Geological Survey (UGS) along with our colleague and carbonate expert, David Eby (Eby Petrography & Consulting, Inc., Denver, Colorado), revealed the presence of microbial rocks in Utah too, particularly in the Uinta Basin. We studied outcrops in the field, well cores stored at UGS’s Core Research Center (UCRC), and a modern example of microbial carbonates forming today—Great Salt Lake. Evaluation of the various microbial fabrics, environments of deposition (facies), petrophysical properties (porosity, permeability, etc. ), changes to the rock over time (diagenesis), and bounding surfaces is critical to understanding these unusual reservoirs. Microbial carbonates are organic sedimentary deposits that form when microbial communities trap and bind sediment (mud and silt) and/or form the locus of mineral precipitation, principally calcium carbonate (CaCO3). They develop in microbial mats, typically composed of bacteria, fungi, protozoans, or algae, and are found in fresh to hypersaline lake (lacustrine), brackish water (bay), or marine environments. 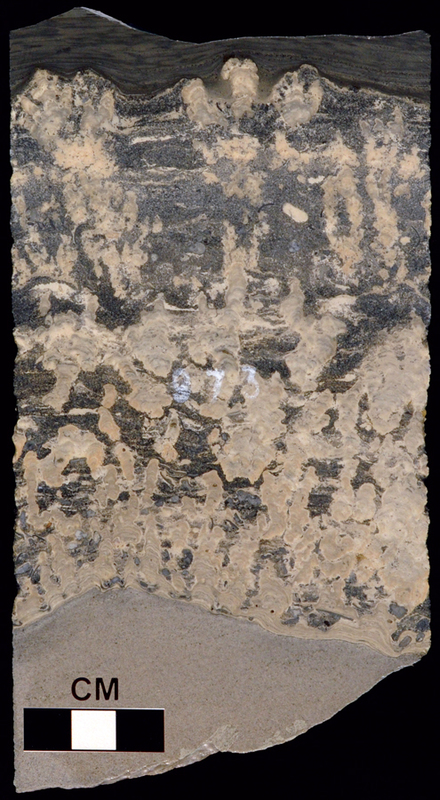 Microbial carbonates take several forms: thinly layered (stromatolites), clotted (thrombolites), spherical (oncolites), and precipitated from mineral-rich springs (tufa or travertine). All of the deposits described above are forming today in and around Great Salt Lake. 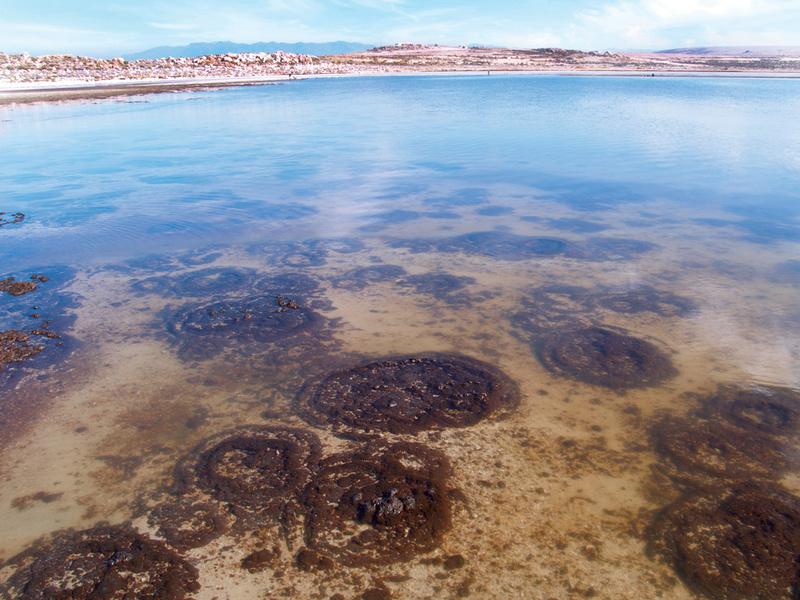 In fact, the lake is a microbial carbonate factory—the slimy muds, the rounded mounds (stromatolite heads and microbial mats several feet in diameter) exposed at low water levels best observed at Rozel Point in the lake’s north arm and in Bridger Bay at the northwest end of Antelope Island, and associated carbonate grains such as the oolites (small, smooth rounded sand) that form beaches and dunes near the lake, are all microbially related carbonates. Now imagine these deposits buried at depths of thousands of feet for millions of years. If they are thick, contain interconnected pores capable of storing oil (reservoir rock), are sealed by impermeable layers of rock above and below, and are located near organic-rich deposits that generated hydrocarbons at the right time, then all the major ingredients would be present for significant oil accumulations. 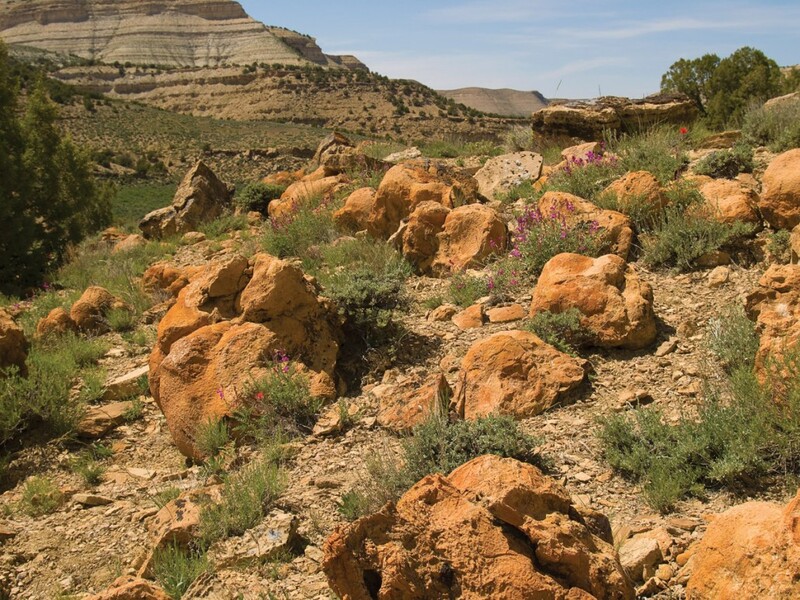 The Green River Formation in the Uinta Basin of eastern Utah was also deposited in a fresh to hypersaline lake—54 million years ago (Ma) during the Eocene Epoch. Outcrops and cores of the Green River display many of the features, vertically and horizontally as well as microscopically, observed in and around Great Salt Lake, as well as in highly productive non-marine microbial reservoirs worldwide stromatolites, thrombolites, oncolites, tufa, and associated grains such as oolites. One small oil field in the Uinta Basin, West Willow Creek, produces from a microbial carbonate buildup. Others may possibly be discovered now that there is a better understanding of these reservoir types. In addition, microbial carbonates are abundantly represented in cores of marine reservoirs in various fields from the (1) Mississippian (340 Ma) and Pennsylvanian (307 Ma) of the Paradox Basin, (2) Permian (260 Ma) and Triassic (250 Ma) of the Kaiparowits Basin, and (3) Jurassic (175 Ma) of the thrust belt, in southeastern, south-central, and northern Utah, respectively. In light of our work, these areas can now be explored for new potential microbial reservoirs and drilling targets. Based on our work with Utah’s microbial carbonates, The Geological Society invited us to present papers at their 2013 symposium—Microbial Carbonates in Space and Time: Implications for Global Exploration and Production. 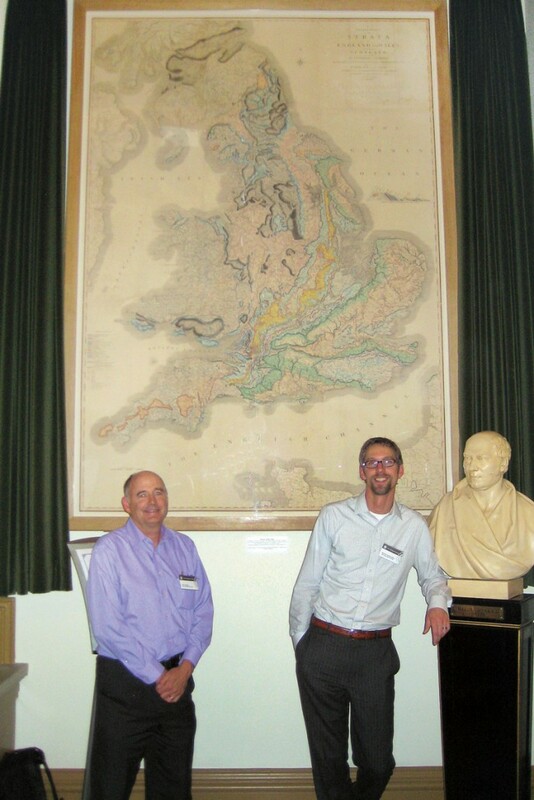 The Geological Society was created in 1807 by the founders of modern geological thought and headquartered at Burlington House near Piccadilly Circus in downtown London since 1870. It is the oldest and most prestigious geological society in the world. Past distinguished members include William Smith, who made the first geologic map published in 1815 (prominently displayed near the entrance hall in Burlington House); Charles Lyell, author of The Principles of Geology in 1830; Charles Darwin, most famous, of course, for his groundbreaking concept of organic evolution published in 1859, The Origin of Species by Means of Natural Selection; and Utah’s own James E. Talmage (1862–1933)—geologist, professor, Mormon (Church of Jesus Christ of Latter-day Saints) scholar, and church general authority. The 2013 symposium was attended by over 200 leading experts on microbial carbonates and representatives of oil companies exploring and developing these reservoirs around the world. Our participation in the microbial carbonate symposium afforded us a great opportunity to learn and exchange ideas with the attendees. Our papers were poster-type presentations where we had one-on-one discussions about the research we conducted, specifically on the microbial carbonates in Great Salt Lake and the Green River Formation. Unique from past Geological Society meetings and very different from the other papers were our displays of representative cores and outcrop specimens of Utah microbial carbonates (carried to London in a suitcase!). In addition, we had slices of reservoir-quality Green River microbial outcrop samples and bags of Great Salt Lake oolitic sand for the attendees to take with them. However, the primary goal (and we hope, the result) of our presentations was to make the attendees and the oil companies they represent aware of the: (1) vast new oil potential of Utah microbial carbonates, and (2) opportunity to come to Utah where they can examine microbial carbonates in cores at the UCRC, and visit ancient and modern analogs represented by outcrops and the environment in Great Salt Lake, respectively, as part of UGS-sponsored training core workshops and field trips. Thus, our “UGS invasion” of London may lead to the exploration and development of new discoveries of microbial carbonate oil resources in Utah. In addition, revenue to the UGS and geotourism in the state may increase as geologists come for training and study to apply Utah examples to microbial oil fields they operate elsewhere in the world.